Meet the Hyde & Sleep mattress! Hyde and Sleep is a UK-based mattress company. They are trying to design an easy to shop for mattress that can meet the needs of most people…and also won’t break the bank. Hyde & Sleep offers two different mattress models; a memory foam mattress that’s built from layers of memory foam and poly foam, and hybrid design, that’s built from layers of memory foam, poly foam, and microcoils. The two models provide a slightly different feel that may be better or worse suited to you, depending on your needs. First up, we’re taking a look at the memory foam version and further down below we’ve got the hybrid Hyde & Sleep. So with all that said, let’s get started! Want to see the quick review? Click here to jump down to the review summary. The Hyde & Sleep memory foam mattress is built from 3 separate foam layers and sits at a total height of 25 cm. 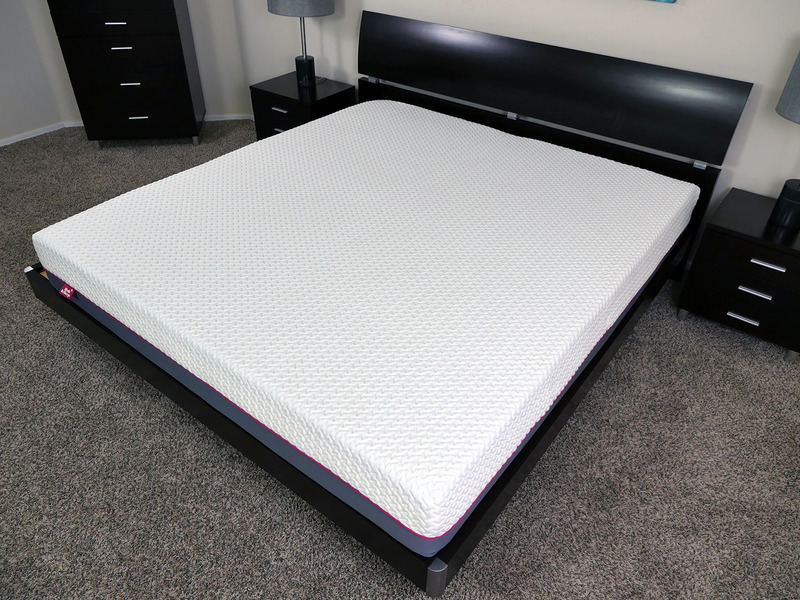 Top layer (cooling & comfort) – 3.8 cm of memory foam. The top layer of memory foam works to provide the initial feeling of softness, contour, and hug for the sleeper. 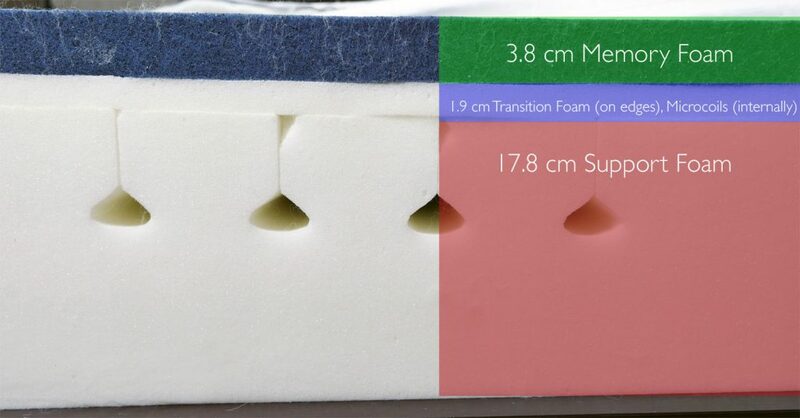 Middle layer (support) – 1.9 cm of transition foam. This layer creates support and helps sleepers ease into the more supportive base foam layer. Bottom layer (foundation) – 17.8 cm of support foam. 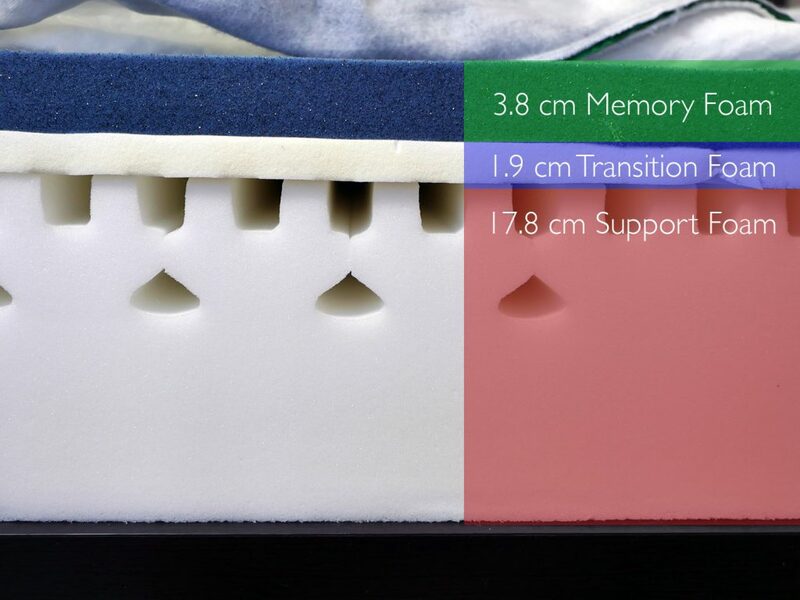 The bottom layer of this mattress contains 7 support zones that work to support the sleeper more where they need it and less where they don’t. Additionally, this layer gives the mattress its shape and acts as the foundation for the mattress as a whole. The cover of the Hyde & Sleep memory foam mattress is constructed from a blend of 98% polyester and 2% Elastane. This makes it soft, stretchy, and highly breathable. Additionally, the thin design of this cover helps to improve airflow in and out of the mattress. Aesthetically speaking, this mattress uses what has become the most popular design for many online mattress companies. An all white top piece of fabric is broken up on the side by a green strip that covers the perimeter of the mattress. Below this green piping is grey fabric that wraps the entire bottom half of the cover. In terms of style the cover is fairly basic, however, the build quality and overall feel is quite nice. It seems well made and durable. The Hyde & Sleep memory foam mattress offers a nice, medium feel, landing at a 5.5-6 out of 10 on the firmness scale (10 being the most firm). As I first lied down on the Hyde & Sleep mattress I was greeted with a nice degree of softness and immediate pressure relief. The top layer of memory foam allowed me to sink into the mattress, yet it did so with a gradual transition. There was no overwhelming feeling of being trapped by the foam layers or feeling as if I was going to get stuck within my own sinkage. Support was probably the area that surprised me the most on this mattress. Typically, I’m not a fan of the softer mattresses due to sleeping on my stomach. More often than not, the softer mattresses allow my hips to sink in too deeply, creating an uncomfortable angle along my lower back and spine. Yet, that was not the case with the Hyde & Sleep memory foam mattress. Whilst sleeping on my stomach, the mattress was able to adjust to my lighter limbs as well, helping to avoid that awkward angle and maintain consistent spinal alignment. Sleeping on my side and back was enjoyable as well. Overall, I quite like the support / comfort dynamic the Hyde and Sleep creates. When looking at the bounce of this mattress, it was essentially what I expected. The memory foam construction is not necessarily designed to be a highly responsive build. The memory foam top layer absorbs a great deal of energy and motion, making bounce and response fairly average. Although, I will say the bounce was not nonexistent. Hyde & Sleep did a good job of still creating some bounce / response with the polyfoam core. However, if you’re looking for a higher degree of bounce / response you’ll likely want to go with Hyde and Sleep hybrid version (see more below). On the other hand, motion transfer was top notch. Not once did my wife and I wake each other during the night when changing positions or getting in / out of bed. This can be a major benefit for couples, but especially couples where one or both partners move around a lot during the night. Cooling was the final area I wanted to touch on. Overall, the Hyde and Sleep did a pretty good job of circulating air and remaining cool during the night. The channels built into the support foam help in improving airflow. If you have average cooling needs the Hyde and Sleep should be fine for you. That said, if you are a very warm sleeper you will probably be better off with Hyde and Sleep hybrid design, as the airflow is even better there due to the layer of micro coils. Lying on your back – as I lied down normally on my back with my weight spread evenly across the mattress, I saw 5 cm of sinkage. Lying on your side – as I rolled over to my side, I saw 6.5 cm of sinkage. Sitting on edge (conservative) – in a normal sitting position with my bottom slightly further back on the mattress, I saw 7.5 cm of sinkage. Sitting on edge (aggressive) – as I sat more on the direct edge of the mattress, I saw 10 cm of sinkage. Standing in the middle – with all of my weight placed at one point in the middle of the mattress, I saw 13 cm of sinkage. Please bear in mind that sinkage results will vary dependent on your body type and weight. For the sake of reference, I weigh 10 stones. The Hyde & Sleep hybrid mattress is also 25 cm thick and contains layers of foam and microcoils. Top layer (cooling & comfort) – 3.8 cm of memory foam. The top layer of memory foam provides the sleeper with the soft feel as they first lie down on the mattress. Additionally, it provides the pressure relief and cooling for the sleeper. Middle layer (support & contour) – 1.9 cm of microcoils. The microcoils used in the 2nd layer work to contour to the sleeper’s shape without trapping them. These smaller coils respond quickly to pressure and provide a level of transitional support, bounce, and response to sleepers. Note, along the edges of the mattress is a support foam (see below). This foam only exists along the edges to improve edge support, while internally you’ll find the microcoils. Bottom layer (foundation) – 17.8 cm of zoned support foam. 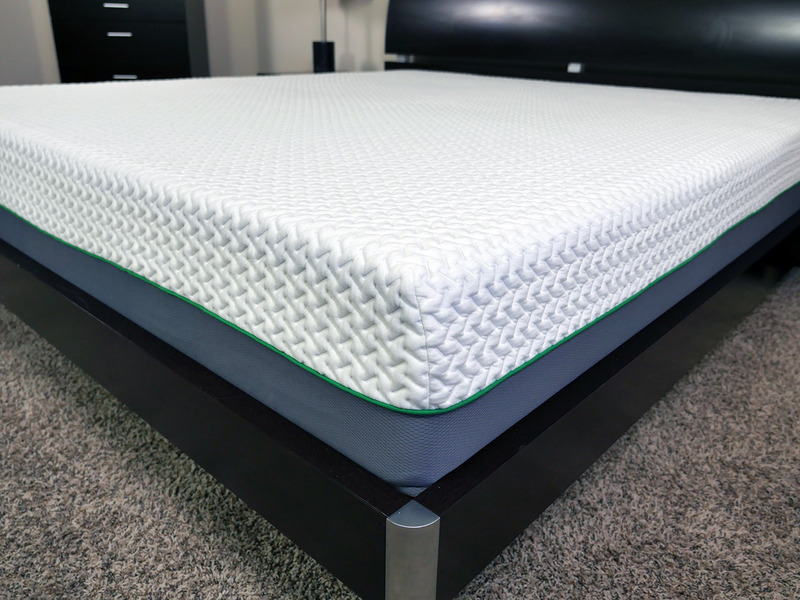 The bottom layer of this mattress acts primarily as the foundational base for the mattress as a whole. 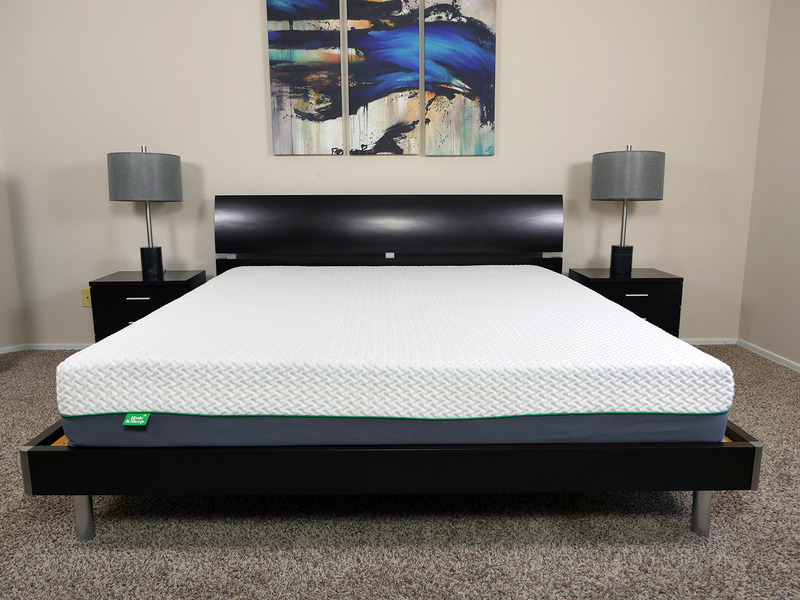 The cover of the Hyde & Sleep hybrid mattress is virtually the same cover that is used on the memory foam version of this mattress. The only notable difference is the color of the stripe used to break up the white and grey sections. As far as materials are concerned, the materials within the cover are exactly the same, 98% polyester and 2% Elastane. The polyester Elastane blend means good stretch and good breathability. Both covers feel extremely well built and quite durable as well. 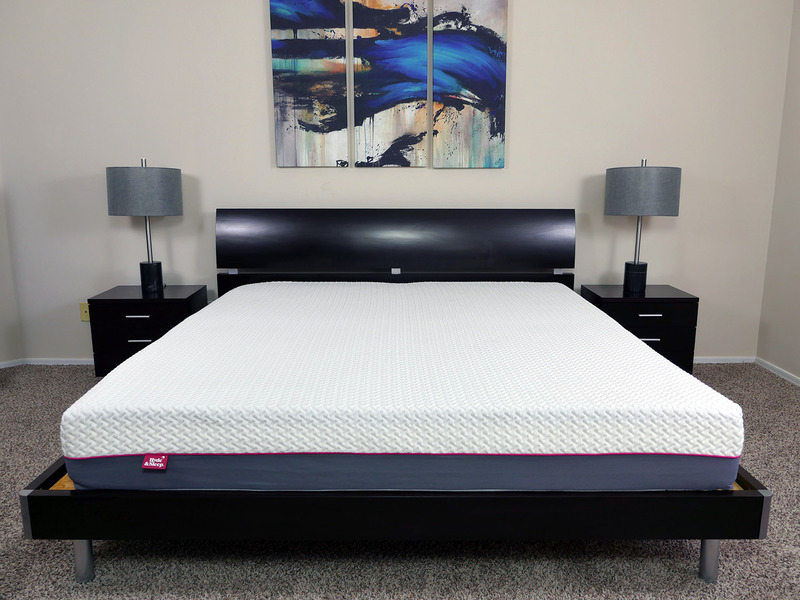 The hybrid model of the Hyde & Sleep mattress offers a slightly firmer feel, coming in at a 6-6.5 out of 10 on the firmness scale, with 10 being the most firm. Similar to the memory foam Hyde & Sleep mattress, the hybrid version welcomed me with a comfortable level of pressure relief and sinkage. That said, the hug was certainly less pronounced. This is due to the microcoils used in the 2nd layer. These microcoils are more responsive than memory foam and also add a degree of bounce. In terms of support, the Hyde & Sleep hybrid mattress did a great job. Once again, I was able to comfortably sleep on my stomach without any issues. In fact, I felt more supported on my stomach on the hybrid mattress than I did on the memory foam version. The difference was not dramatic, but I will say the pocketed springs did feel as if they were providing a supportive level of push back against my body. As I rolled over onto my side, the support of the mattress did not change. Although, I did enjoy the pressure relief of the memory foam mattress more so in this position. Finally, my wife (primary back sleeper) stated that she was able to easily sleep on her back on the Hyde & Sleep hybrid mattress. Due to being a touch firmer, the mattress did not allow her to sink in so deeply that she lost support in certain areas. Instead, the mattress provided a balanced level of support from head to toe. The bounce of this mattress was another impressive characteristic. The microcoils played a large role with regards to bounce. Their ability to respond quickly to pressure means a higher level of bounce. This makes moving around during the night, getting out / in to bed, and of course amorous activities, better. That said, the bounce of this mattress does lead to a little more motion transfer. By no means is the motion transfer overwhelming, but it is not as good as the memory foam version of the Hyde and Sleep. Next up, cooling. The coils helped to create a higher level of breathability in and out of the mattress. The microcoils + air channels in the base foam + thin cover all work together to great effect. The combination of these features allows air to more easily enter and exit the mattress, helping to better regulate the temperature. Finally, the edge support of this mattress was an improvement over the memory foam Hyde & Sleep. Neither Hyde and Sleep is quite as good as a traditional spring mattress, but they are still both above average compared to most foam and hybrid mattresses. All things considered, I’m a fan of the hybrid version of the Hyde & Sleep mattress. The support, comfort, bounce, response time, edge support, and cooling all made for an enjoyable sleeping. Once again, I weigh 10 stones, so bear in mind that your sinkage results will vary based on your size. Which Hyde & Sleep mattress should I buy? Want a medium feel – the Hyde & Sleep memory foam mattress comes in at a 5.5 out of 10 on the firmness scale, where 10 is the most firm. Want a memory foam mattress – with a memory foam construction, this mattress offers slower response times, a more pronounced contour and hug, and slightly better pressure relief. You’ll want to be sure you’re a fan of the slower response and deeper sinkage if you’re considering this version of the Hyde & Sleep. Want less bounce – once again, the memory foam build means less bounce. This mattress does not provide much of a push back with regards to amorous activities as well as daily activities. Want less motion transfer – with less bounce comes less motion transfer. For those looking to avoid being awoken by a partner, the memory foam Hyde & Sleep is certainly a good choice. Want a medium-firm feel – the Hyde & Sleep hybrid mattress lands at a 6 out of 10 on the firmness scale. 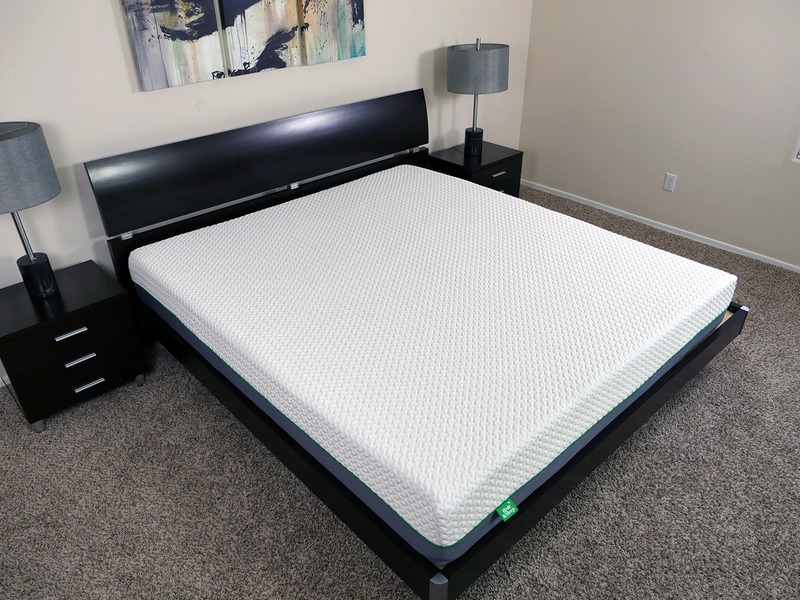 Like the idea of a hybrid mattress – the hybrid design uses both layers of foam + coils to create a best of both worlds environment, providing good pressure relief, bounce, cooling, and response. 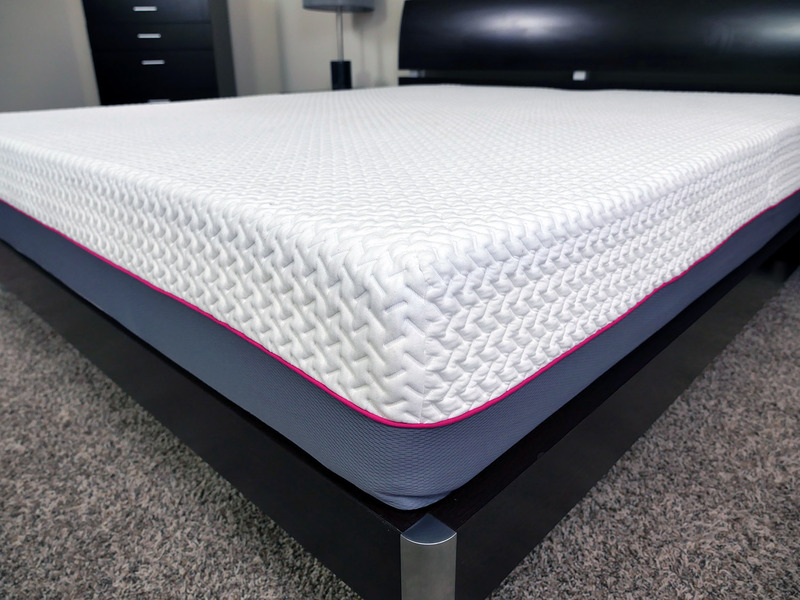 Want more bounce – the coils used in this mattress help the foam layers to respond, providing a higher level of bounce than the memory foam Hyde & Sleep mattress. Want better edge support – the build of this mattress is designed to be able to handle more weight along the edges (due to the coils). Therefore, if you’re someone who likes to sleep near the edge of the mattress, the Hyde & Sleep hybrid model is a good choice to consider. For more on the Hyde & Sleep mattresses visit HydeandSleep.com. Hyde & Sleep created not only one mattress, but two right from the beginning. Their memory foam version of the mattress offers good support, pressure relief, cooling, and more of a pronounced level of sinkage and hug. On the other hand, the hybrid Hyde & Sleep mattress is a touch more buoyant, proving less sinkage and more pushback. Again, this mattress is still very supportive and carries a lot of the same characteristics that the memory foam mattress contains. Hyde & Sleep has done a nice job with these two mattresses and for those sleepers looking to upgrade their mattress, this company is not one that should be overlooked.